A structured tutorial for learning how to organize, estimate, build and manage a complex project.-- Excellent use of the proven Teach Yourself in 24 Hours format, giving readers a one-hour lesson for each major portion of project management.-- Author is an experienced trainer and writer as well as an expert in software and other tool-based methods of project management.-- Covers the project in a chronological fashion going in-depth to each stage including the traditional and technical methods of tracking.Now you don't have to be an MBA or advanced specialist to learn the principles of project management. 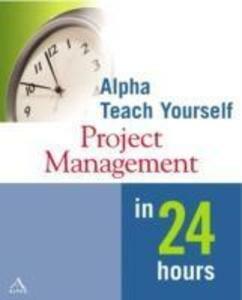 Alpha Teach Yourself Project Management in 24 Hours gives readers a lesson-by-lesson approach to learning the ins and outs of budgets, team-building and tracking. Recognizing that most projects are managed electronically or online today, the author also shows better and more efficient ways to track and achieve goals.